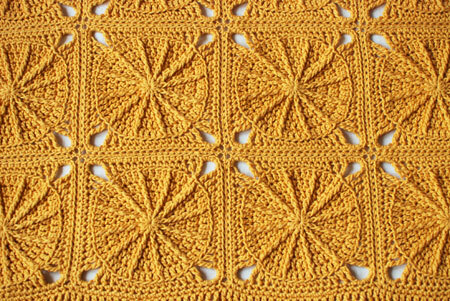 Pattern: Sunny Spread blanket by Ellen Gormley. This is a wonderful pattern, and works very well as an easy, portable project because it’s constructed from individual squares. 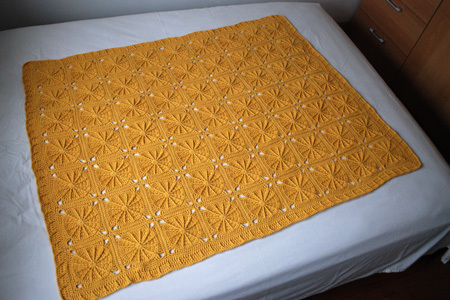 I wish the pattern included the dimensions of an individual square, as well as an idea of how much yarn is used for the main portion of the blanket versus the border. Yarn: Berroco Weekend in the 5921 (banana) colorway. A lovely, happy, unisex yellow ;). 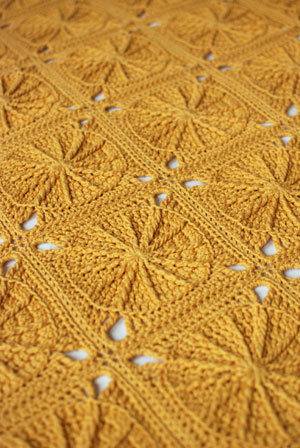 I used about 11 skeins for the main part of the blanket and a little less than 2 skeins for the border. The yarn crocheted very nicely and has a lovely drape. I had to wash the blanket by hand (because the washer was broken, again), but wouldn’t hesitate to machine-wash in the future. I’ll be sure to relay the care info to the recipient. I originally purchased 15 skeins from WEBS, so I even have enough left over for a little baby jacket :). Crochet hook: Brittany Birch, size H (5.0 mm). I’m typically a metal hook/needle lover, as you know. I initially purchased this crochet hook because I was flying through Heathrow, and was warned against carrying any metal implements through security there. As it ends up, I really enjoyed using it, and have since purchased a few additional sizes! Other than the number of squares, I only made one modification to the pattern (and it was an inadvertent one, at that): I seamed the squares together using the backs of the loops only. I liked the way this outlined each individual square, though, so it’s a modification I’m happy to keep! This is beautiful!! I was thinking if I made this I’d want to use more than one color as it would drive me crazy to crochet so many squares that look EXACTLY THE SAME, but I really LOVE this monochrome one so maaaaybe it would be worth the boredom! It’s gorgeous! What a lucky baby to get such a beautiful blanket. Your craftsmanship is truly great. Lovely! I really like the golden yellow. It makes me want to dust off my crochet hooks. Such a bright and happy blanket! I also seamed mine using back loops only because apparently I was in a crazy finishing frenzy and instead of reading the directions just went ahead and seamed like I thought should be done. What a lucky baby! Wow. That blanket is gorgeous! It even has me considering taking up crochet! That’s really lovely. It sort of reminds me of those embossed tin ceiling tiles. It’s magnificent. Love the color, the pattern, the style, and bet it will be adored! All your work is so well done. Congrats on your exciting news, too!! I wish I had the patience to learn how to crochet properly, stunning! just beautiful. i AM going to learn to crochet now. that pattern is quite elegant when made with just one color. congrats on a lovely blanket! Wow, that’s a really lovely blanket. Love the color. That is a beautiful blanket. I love how it looks lacy without being lacy (does that even make sense?!). 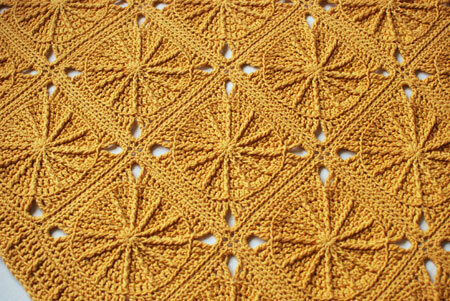 I really should try a motif pattern, because I know how to crochet but I’m not very comfortable with it yet. Something repetitive would definitely make it easier for me to feel like I’m improving. Unisex yellow??? Well..I never…Anyhow, the blanket is gorgeous. This is so pretty and I really love the color. I also have this in my queue to do in the very near future. i like your seaming modification too. i may adopt it when it comes time to finish the sunny spread i’m working on. Beautiful color and beautiful blanket! I like bigger baby blankets myself so this is a great size. Beautiful job! I love how this turned out. Thanks for sharing your info on the yarn amounts and dimensions. I’ve got 11 skeins of Weekend in stash and your notes will help me figure out how far it will go. Very beautiful! I love block blankets made all of one color. It really highlights the pattern. I love this so much! This totally makes me want to learn to crochet! What a happy, sunny blanket! Very pretty. This is one of those patterns that makes me want to learn how to crochet. lovely! i really like that you chose all one color – very elegant. I’m impressed with the afghan. The unusual color is striking and the pattern most unusual from the granny squares seen so often. Beautiful blanket! Now I need to make one. Did you sew or crochet the squares together? Whichever way, using back loop only looks great! Wow this looks fantastic, I love the color! This blanket makes me want to try crochet again. clever mod on the seaming! the squares are really nicely defined. and I definitely share your feelings about yarn requirement info with this pattern. since my border and the outer portion of each square was all in white I had no clue how much yarn to order. 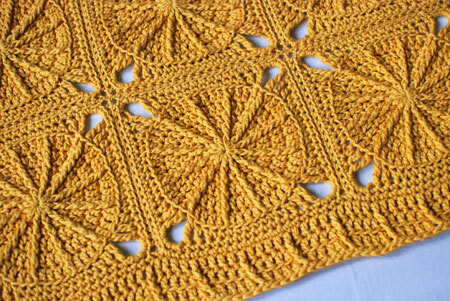 I queued this a while back on ravelry and every now and again it crosses my mind to start one. Seeing this gorgeous finished one makes it cross my mind and stay there! Lucky baby and beautiful work. After reading your initial post on the Sunny Spread Afghan, I decided to make one as well. It was my main project while I was studying abroad in Australia because, as you say, it is extremely portable. I love my afghan; it represents so many hours of (boring) class lecture or late nights watching movies and reminds me of my time Down Under. What a lovely, lovely blanket! What a gorgeous blanket! Very bright and classy! WOW! Everything about that blanket is stunning and incredible!